Thank you for your response...this is what I know from papers sent to me...and I can't fill in details. I do have a photo but don't know how to send it. Date unknown when he married my mother. I am his only child born 8-10-31. I don't know what family he may have had. 12-11-31 Transferred this date to USS West Virginia. "Served on board 1931-1932 when ship won battle efficiency pennant, gunnery trophy and engineering red. E. Officers and crew collectively commended by President and Secretary of Navy". 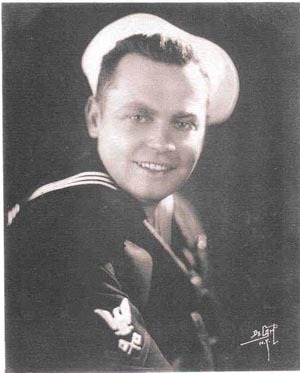 10-14-33 Transferred to the USS California for duty with commander battle force signal force. Undated Personal note: " I am Valleon Sylvester CQM USN Anyone hearing this please notify (wife). Received box and letters. Am doing well. Love to all." This was attached to a large scrap of paper on which he wrote: " V. Sylvester, CQM, USN. We were sweeping the approach to the mine fields on a clear sunny day at the entrance of Manila looking for stray mines. Off in the distance could be seen several enemy planes circling around. At any moment we expected to be attacked by plane or submarine. Suddenly we heard the whine of a plane in a power dive. No one had spotted this plane so we assumed the plane was coming out of the sun. All guns were trained and fired blindly into the sun and in a second or so the plane was seen. One bomb was dropped which missed us by about 200 yards. The plane turned away and disappeared into the distance. No hits, no runs, no errors." 03-17-42 First of two postcards (one month apart) passed by naval censor "nothing is to be written on this side except to fill in the data specified. Sentences not required should be crossed out. IF ANYTHING ELSE IS ADDED THE POST-CARD WILL BE DESTROYED. His data reports "I am well. Letter follows at first opportunity. I have received no letter from you for a long time. Undated Postcard from Philippine Military Prison Camp No.3 ( Imperial Japanese Army) "I hope this ends soon. I am impatient to be home. All is well, give my regards to everyone. Love, Val."